The Kangaroo is undoubtedly the most remarkable and iconic Australian animal endemic to the country. There are four species of kangaroos and together, their population in Australia is more than that of people. Using their powerful hind legs, they can jump a distance of 15 feet at a time. They are also known for the pouch that the female has in which the newborn kangaroo (Joey) lives for nine months until it is fully developed. The Kangaroo is Australia’s national symbol. The only mammal that uses hopping as their primary method of locomotion. Hopping is one of the fast and energy efficient means of communication that helps them to cover large distances in a short span of time. There are four species of kangaroo namely, the Red, Antilopine, Eastern Grey and Western Grey Kangaroo. One of the most social animals usually stays in groups of 3 or 4 individuals, however, some groups can have as many as 100 individuals. Though this animal is frequently called the Kala Bear, it is more closely related to kangaroos than bears. Koalas usually live in Eucalyptus forests and are adapted to living on a tree, where they spend most of their lives. They have grey or brown woolly fur. Also, one of the slowest animals that can live for a long time without water – they get most of their water requirement from the eucalyptus leaves they eat. You can also read about a few nocturnal animals that are only active in the night. The species measures about 60cm to 85cm long and weighs approximately 14kg. It is ofently known as koala ‘bears’, however, the amazing animals are not bear at all because they come under marsupials. The infant koala is known as a joey and later it immediately climbs upto the mother pouch. The newborn is bind and earless and uses its strong sense of smell and touch to find its way. Platypuses are by far the strangest looking of Australian animals and look like they have the beak of a duck, bodies like an otter, feet like a duck and the tail like a beaver. They are extremely rare and found only in Eastern Australia. They also have thick waxy waterproof fur that helps them to dry faster and keeps them warm. 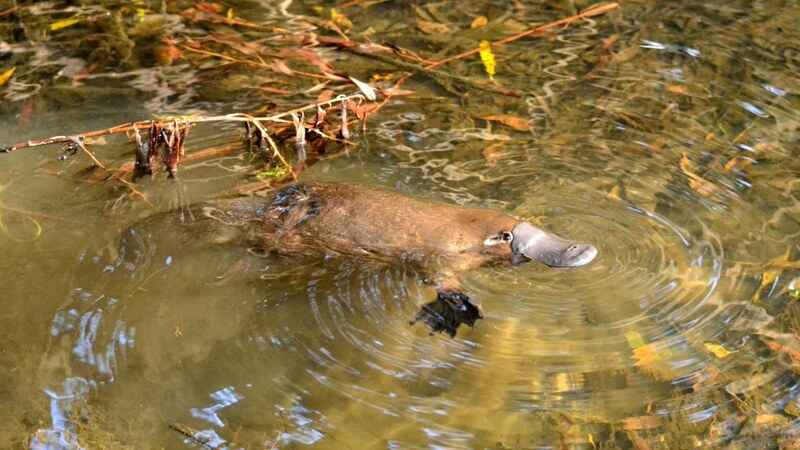 Male platypuses have poison producing glands on their legs but this is not fatal to humans. The most amazing thing about this Australian animal is that it is one of the two mammals in the world that lays eggs. The lifespan of the platypus is about 12 years in the wild, however, in captivity, it lives for 17 years. The weight varies 0.7 to 2.4 kg where males have little more weight as compared to females. The average length of the male is approximately 50 cm, however, females are little shorter in size with an average total length of 43 cm. It is born with a webbed foot that helps them to swim more efficiently in muddy surfaces. They are one of the excellent swimmers and can spend ample time in water foraging for food. You should also know about a few animals found in Arctic region. The third largest bird in the world, this flightless creature is native to Australia and may grow up to 6 feet in height. It lives in wooded areas and grassland and is also commercially reared for its eggs and meat. Using their long muscled legs, emus can run at speeds of more than 40 kilometres per hour and have talons on their feet. Talking about the appearance, Emu has a long neck with sharp beak and small ears. The body is covered with large brown feathers and each of them has a double shaft. The small wings of emu provide them stability during running. They have two eyelids, one is used for blinking, however, the other one is used to prevents dust and sand to enter the eyes. In order to survive, they used water on a daily basis, so during cold weather, the nasal passages of emu recycle air for creating the moisture that can be used. The species is omnivorous that eats both plants and animals. It loves to eat caterpillars, large insects, small lizards, rodents, flowers, seed, buds and shoots. Sometimes they also swallow small pebbles and rocks to accelerate digestion. This distinct looking animal lives underground on the grasslands and mountains of South-eastern Australia. There are three species differentiated by the hair on their nose (bare nose and hairy-nosed) and they grow between 2.5 and 3.5 feet in size. They dig burrows up to 1 meter deep and venture out for foraging only at night. While hairy-nosed wombats live in colonies, barely nosed wombats are solitary animals and live alone in burrows. One of the nocturnal animals start its search for food when the temperature drops and it will be the appropriate time to leave their burrows. The species is herbivores and love to eat grass, roots, shrubs, moss and bark. It is the fast runner that can run upto 40 miles per hour, however for short distances only. The average lifespan of the wombats is five years in the wild and 30 years in captivity. The Echidna is a small animal about 15 inches in length and weighing around 6 kilos. It has hair and spines on its body to protect against predators and when it is under attack, it rolls itself into a ball to protect the spines and drive away the attacker. The most striking feature is that it is one of two mammals in the world which lay eggs, the other being the platypus. They do not have teeth and use their superior sense of smell to locate insects underground, which it feeds on. One of the small Australian animals can grow upto 13.5 to 17.5 inches in length and weighs around 6.5 to 14.5 pounds. Talking about the appearance, the body of the echidna is covered with two types of hairs namely long hairs and short hairs. Long hairs help them to protect themselves from predators, however, short hairs act like a fur that regulates body temperature. The spine of the echidna is made up of keratin the same substance that builds human hair and nails. The species don’t have teeth and use strong pads in the mouth to grind food before it is swallowed. One of the strongest animals can lift weight upto double of its weight. The species can live upto 50 years in captivity. 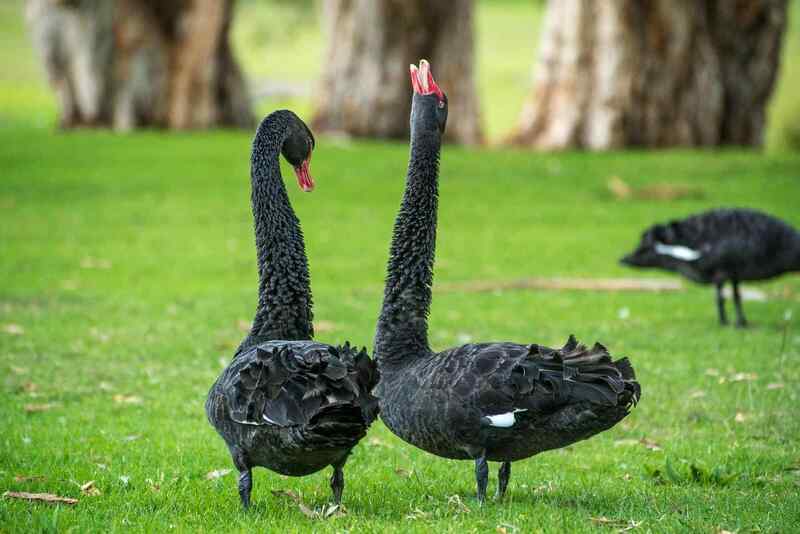 As is evident by the name, the black swan has black plumage, a red beak, and white wing tips. Within Australia too, it is found within the limited area of Southern Australia in wetlands. It is a large bird with a wingspan of around 2 meters and weighs up to 9 kilos. Every year during the breeding season, they build nests in the wetland and lay four to seven eggs. At the end of this season, they shed their feathers – called moulting – and regrow them by the next mating season. One of the most common Australian animals can be seen throughout Australia where there is a large body of water except for the very far northeast. The species has also been introduced to New Zealand and have been seen flying to Indonesia and New Guinea. The species are vegetarians and love to eat algae and underwater weeds with the help of long necks to reach deep inside the water. This small animal distinctly recognized by its large pointed ears and snout lives underground and is endemic to Australia. They are expert diggers and live in burrows to hide from predators like dingoes and foxes. They avoid coming out during the day and forage for food – both animals and plants – during the night. They are solitary animals with males being larger than females and come together only once a year during the mating season. Talking about the appearance, the greater bilby has black coloured eyes which are nearly 1 centimetre in diameter, however, it does not give a clear vision. The greater bilby relies on its strong sense of hearing and smell to get it protected themselves from the predators. This is a type of wild dog introduced to the continent of Australia about 5,000 years ago and has since then flourished in the forests, woodlands, and grasslands in the country. They are Australia’s largest land-based predators and attack in groups of less than 10, which helps them bring down much larger animals like kangaroos. They usually feed on rabbits, rats and other rodents, wallabies, and kangaroos. Their size and behaviour are similar to that of wolves and they use howling noises to communicate. One of the most popular Australian animals can reach upto 3.5 to 4 feet in length and weighs approximately 22 to 33 pounds. Talking about the appearance, the fur is usually reddish-brown in colour covered with white markings, however, dingo that lives in forests have darker fur. The species can able to rotate its heads for almost 180 degrees in both directions. It is omnivorous and loves to eat rabbits, wallabies, kangaroos, birds, lizards and domestic animals, however, sometimes they have been spotted eating berries and fruit. They usually hunt at night and can travel at a speed of 37 miles while searching for food. The average lifespan of the species is 5 to 6 years in the wild and up to 15 years in captivity. Since most of these animals are endemic to Australia, they cannot be seen anywhere on this continent. There are few animals found only in Africa. So when are you planning to visit this southern continent to see some of these amazing Australian animals?